Tom Brady and Peyton Manning, the two preeminent passers of their generation, will face off again Sunday. If you believe in superstitions, then 13 is considered an unlucky number, an ominous integer to be feared and avoided. But triskaidekaphobia takes a holiday on Sunday at Gillette Stadium, where quarterbacking icons Tom Brady of the Patriots and Peyton Manning of the Broncos (that still sounds strange) resume one of sport’s greatest individual rivalries. Brady and Manning face off for the 13th time Sunday, and we’re all lucky. They’ve combined for six NFL MVPs, four Super Bowl titles, three Super Bowl MVPs, and the two highest single-season touchdown pass totals in the history of the game. They’ve been part of an arms race that has defined the last decade of the NFL. Now, it’s history in the making every time they meet. Sunday will mark the first time that two starting quarterbacks will enter a game with 300-plus touchdown passes. Manning (407) ranks third and Brady (307) fifth on the all-time TD pass register. So, set the DVR and savor every second of the action because who knows how many more times we’ll get to see the two preeminent passers of their generation trade pinpoint passes and astrophysicist-IQ audibles. All great rivalries — Ted Williams vs. Joe DiMaggio, Bill Russell vs. Wilt Chamberlain, Larry Bird vs. Magic Johnson, Bjorn Borg vs. John McEnroe, Muhammad Ali vs. Joe Frazier — are both transcendent and existential. They live on infinitely in discussion, but die definitively in action. Brady, now in his 13th season, has made clear his plans to play into his 40s, but he already missed the 2008 season with a torn anterior cruciate ligament in his left knee, and like any NFL player is one hit away from having his career plans altered. Peyton Manning and the Broncos invade Foxborough. 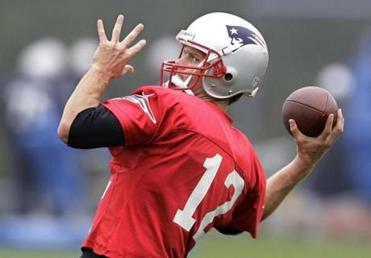 Jim McBride has the scouting report on how Tom Brady and the Patriots can beat them. In his 15th season, the 36-year-old Manning has returned to the game after missing last season with nerve damage in his neck that required multiple surgeries, the last fusing bones. His return was not a fait accompli. Neither is his return to pre-injury form. Manning demands excellence from his teammates, and if he can’t provide it himself he’ll exit the huddle, stage left. The Patriots won’t play the Broncos next year in the regular season unless both finish in corresponding places in their divisions, the AFC East and the AFC West. If the pattern of history is run with the same precision that Brady and Manning demand from their receivers, then Sunday’s game should be an instant classic. Brady has an 8-4 record in the 12 meetings, but Manning has won four of six since 2005. These Brady-Manning games have become murder for manicurists. The last five times Brady and Manning have faced each other the games have been decided by 7 points or fewer and been in doubt in the final three minutes. The list includes the Colts’ heartbreaking breakthrough win over the Patriots in the 2006 AFC Championship game, the Patriots’ redemption in Indianapolis during the 2007 perfect regular season, and the famed fourth-and-2 failure in Indy in 2009. When Manning was last here with the Colts, the Patriots nearly blew a 17-point, fourth-quarter lead, with Manning throwing for 396 yards and four scores. It appeared Manning was driving the Colts for the winning score — or at minimum the tying field goal — when he was picked off by James Sanders to preserve a 31-28 Patriots victory. 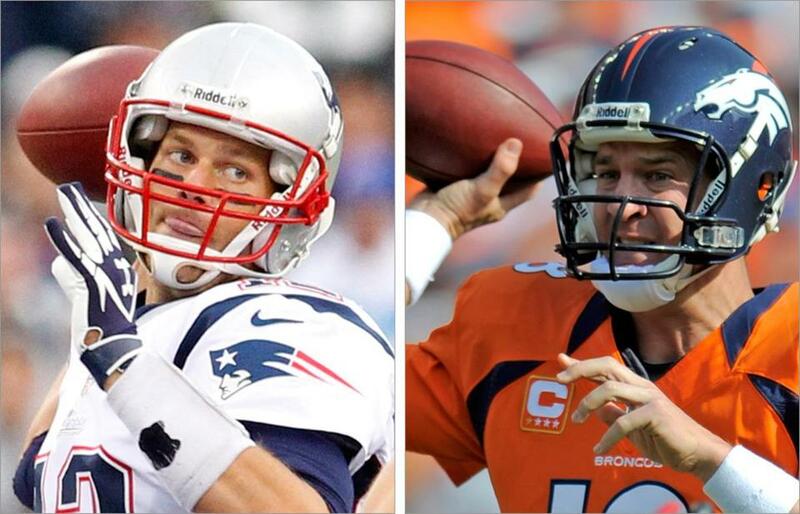 Asking who is better, Brady or Manning, is like asking whether one prefers Prada or Gucci? It’s a matter of preference, not quality. Brady might have the slight edge, however, at this point. He still looks to be a quarterback at the peak of his talents. After his surgeries, Manning is like a great power pitcher who now has to use a little more guile and finesse to get hitters out. The nerve damage has robbed him of some MPHs on his fastball. All three of Manning’s interceptions, which came in a 27-21 loss against Atlanta, were on passes that traveled more than 20 yards in the air. But Manning’s best attribute was never his arm. It was always his microprocessor of a mind. The Broncos are now the Colorado Colts. Denver is lucky Apple doesn’t own a NFL team or it would sue the Broncos for patent infringement, so blatantly have they ripped off the Manning offense from Indianapolis. Manning still can dissect defenses with the best of them, just ask the Steelers and Raiders, both of which saw Manning complete more than 70 percent of his passes. Of course, neither Brady nor Manning, consummate teammates and leaders, would want the focus of Sunday’s game to be on them. This meeting between the canonized QBs is meaningful for more than the Brady-Manning reunion. Both the Patriots and Broncos enter at 2-2 on the season. Neither team expected to be 2-3 after five games. One will be. Brady and Manning have been measuring sticks for each other for a while. “He’s really set the standard for quarterback play over my entire career,” Brady told Denver reporters. The entire 2007 season felt like Bill Belichick showing the world that his quarterback could provide the same passing pyrotechnics as Manning if the Patriots wanted to play that way. Manning winning the Super Bowl during the 2006 season was his riposte to the idea that he was the stats guy and Brady was the winner. What’s cool about this rivalry is like Magic and Bird, Brady and Manning have morphed from rivals into confidants. No matter the teams, uniforms, or times, No. 12 and No. 18 are lucky numbers when they’re added together.